I'm so sorry I missed you birthday, sweetie. is that you will get back all you give away. I love laying in the sand on a sunny evening. Looking around I feel comfortable, lazy, proud, too. Who had believed that I have a soft spot for … blue. Take the plants in our garden behind me. I replaced old and rotten plants with new ones. Blue ones. Deep dark blue larkspur, bluebells, anemones, lilacs, Alpine roses, pink gladiolas … in the evening hours it always seems these shades of blue touch the blue of the sky, melting into it until you can’t tell where flowers end and the wideness of the universe begins. Touching one of the blue Jacob’s Ladders with buds like butterflies make me smile. Turning around on the little pier leading to the sea I notice some starfishes. Bizarre creatures they are. Even they have no faces they know exactly where to go. They must be strong to surviving but they are vulnerable as well. This ones have five arms which radiate from a central disk, the surface looks spiky … they are almost gliding across the sea floor… Don’t they have microscopic eyes at the end of each arm? 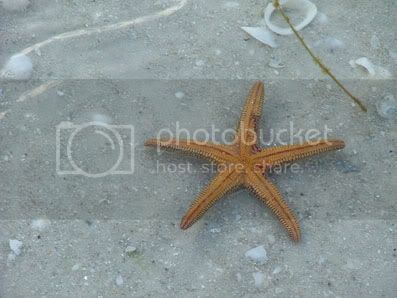 This enables the starfish to view movement and differentiate between light and dark. Light and dark … I love these quietness when Sister Day says hello to Brother Moon. Soon I’ll be sandwiched between stars … stars high above… stars below the water surface. Feeling the water slipping through my fingers makes me feel calm and grateful. Tiny waves are lapping around my hand, teasing me to enter the sea. The water feels soft, peaceful, cool and … blue. As feels the hand of my lover barely touching my shoulder. I’m sure not many people are able to just take time and let this happen. and especially the one star beside me.